The very first time I ever got my compost pile to heat up… I mean really heat up to the point of visible steam coming from the center of the pile… I was ecstatic! It was pretty much all I could talk about for a week. I had a pretty large open-air pile that was about half way through the decomposition process. I decided I really wanted to work on getting a finished product more quickly so every day after work I went to the nearest coffee shop to get spent coffee grounds. I threw these on top of the pile and the result was STEAMY compost. 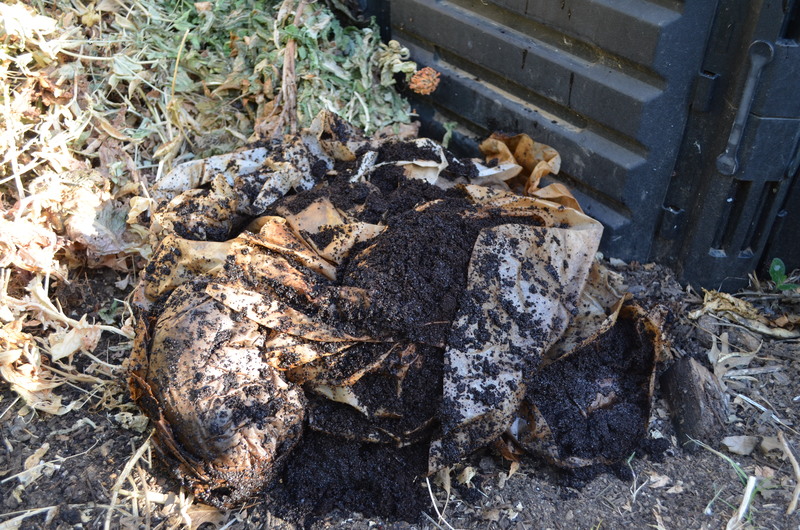 Ever since then, I have been a true believer that coffee grounds as an addition to your compost pile makes for faster and hotter compost plus your compost smells like coffee. So that’s a winning compost pile if you ask me. Every few weeks I go to Peet’s Coffee and Tea to get my pound of coffee and I always ask if they have grounds to take away for my garden. I love my Peet’s because they will help me carry the usually very heavy bag full of coffee grounds and their filters to my car, which is especially helpful when I have the baby in one arm and my coffee in the other. This stuff is black gold my friends and they just give it to you for free! 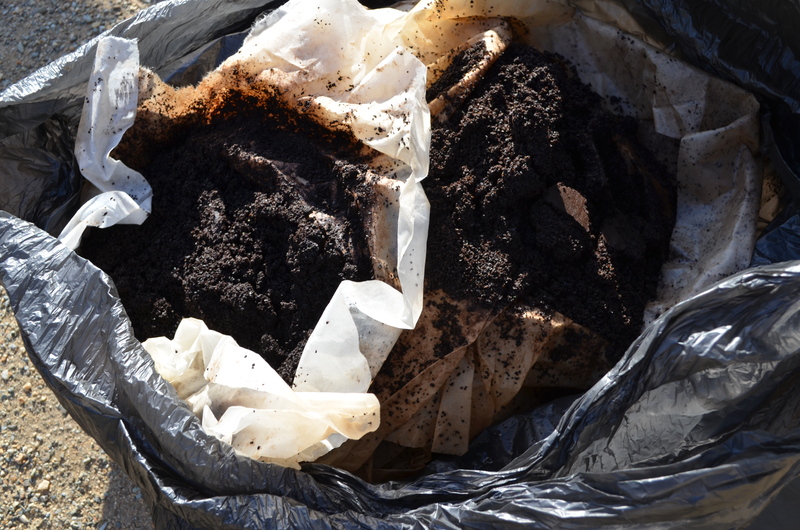 Usually I just dump the coffee grounds directly into my compost pile. I take a little extra time to tear up the filters into smaller pieces because I find that they take much longer to decompose if I don’t and they are so large that I am worried they will create a smothering layer in my compost when I want to be promoting as much air as possible. I also throw a few grounds onto my blueberries from time to time since they love the acidity. I haven’t used coffee grounds directly in my garden beds but I think it isn’t a bad idea if you use it sparingly since worms go crazy for coffee grounds. So next time you are in a coffee shop just ask if they have grounds for your garden. I find most coffee shop employees are more than happy to help you. Most coffee shops have some system (some shops don’t separate out their grounds from their garbage) so find out what works best for them and best for you. I have even left a 5 gallon bucket at the shop for them to fill up during the day and then I pick it up in the evening. Sometimes I ask for grounds and I get blank stares from the employees but I find that most employees have an understanding that the grounds can be used in gardens and it isn’t the first time they have been asked that question. Also once you build a relationship with your coffee shop it is much easier to get grounds. What could be better than a free resource that you help keep out of the waste stream while it helps you build your soil? Plus you can get a nice cold afternoon latte as a treat! 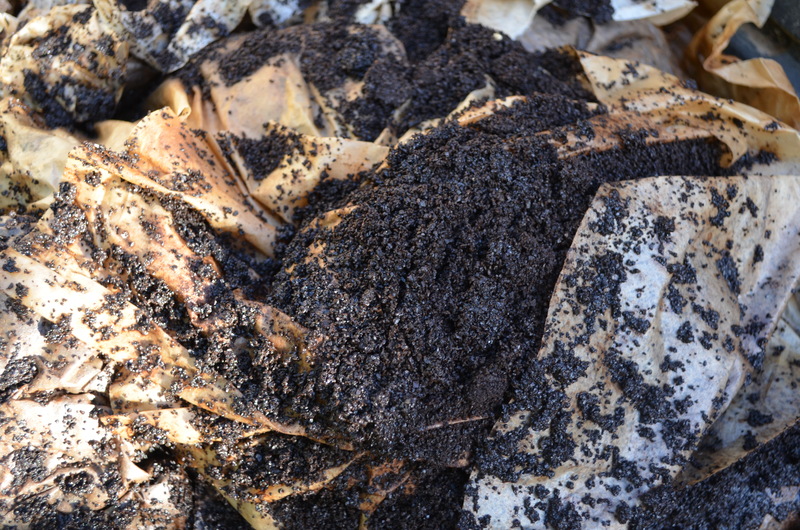 Tags: coffee grounds, compost | Permalink.